As the Paralympics enters its third day in London, audiences will be watching the best disabled athletes compete in a range of disciplines throughout the Olympic Park. But not everyone taking part in the Games is disabled - able-bodied athletes compete in a number of sports as part of teams and pairings with those who have a visual impairment. Barney Storey's pub trivia fact is that sprint tandem pilots, such as himself, were the only able-bodied Paralympic athletes who could previously be awarded a medal. That will change for the first time this year as all athletes who guide Paralympians will be eligible for medals. The change means pilot cyclists will be joined by guide runners and sighted goalkeepers in blind football. Mr Storey, who lives near Stockport, Greater Manchester, was training with the sprint squad at the National Cycling Centre, in Manchester, when he was offered the chance to take part in the European Championships in 2001 as a tandem pilot. He said: "As soon as I jumped on [the bike] I really enjoyed it. I was keen to do more." He added the decision to commit full-time to Paralympic sport had been a "no-brainer" after that first competition. Since then he has competed at the past two Paralympic Games, winning two gold medals at Beijing for the tandem kilometre, for which he beat the world record, and the tandem sprint. As well as winning medals Mr Storey also met his wife through Paralympic sport. Sarah Storey is one of Great Britain's most successful athletes, having won 18 Paralympic medals in swimming and cycling and national and World Cup titles in able-bodied cycling competitions. He describes the tandem event as a "50/50 effort" between himself and Neil Fachie. "The two chains [on the bike] are linked so the effort he puts in results in the bike going fast," he said. "It involves incredible trust from Neil - we go at 45mph so you do have to have a fair amount of trust. "It's not something I could do." Tandem cycling used to be an Olympic sport but was discontinued after the 1972 Munich Games. 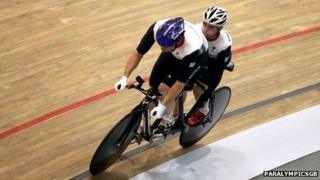 For Mr Storey the skill and speed involved is the same as that found in Olympic cycling. He said: "The times we're getting now are incredible. "It [Paralympic tandem cycling] was only introduced in Atlanta in '96 but we're now getting faster than the able-bodied athletes were." Another able-bodied athlete set to compete in London 2012 is goalkeeper Dan James. Unlike Mr Storey he is not a full-time athlete, having taken a wage cut from Devon and Cornwall Police where he is a police community support officer (PCSO), in order to compete internationally. The 25-year-old, who used to be on the books of Exeter City, is hoping, with other members of the five-a-side football squad, that London 2012 will raise the profile of the sport and lead to a full-time team. He is the only sighted player on the squad - everyone else wears eyeshades to take account of different degrees of visual impairment. Mr James, who played through the ranks of the Devon club from the age of 11, was dropped at 18 when the team were relegated. But he said the sport had restored his love for the game. He said: "About six years ago I was working in a leisure centre in Exeter, while there I met a blind football player, Keryn Seal, who I helped around the gym with his exercise. "He talked to me about blind football and said they used sighted goalkeepers. I was quite intrigued by the idea so he invited me to a training session." Mr James was selected for the team and took part in his first Paralympics in Beijing in 2008. He said at the time the sport had been unheard of by most people. "A couple of my friends thought I was joking because they hadn't heard of it but my friends and family have been very supportive. "I showed them some videos so they could see what the game was and they realised it was a sport to be taken seriously." He said the challenges of defending the goal in five-a-side were different to the sighted game - the goal is smaller and the goalkeeper cannot leave the box although the other players can enter it. He said: "There is more emphasis on communication and more trust because it's really on you to give the players the information they need and save the ball." And although this is the first Games at which he is eligible for a medal, he said it would only be a "small part" of what he gets from playing. "The players I train with are very humble people, they work to the limit and don't let their disability hold them back," he said. "They are inspirational and they are also my friends - we're a group of mates."